These high quality hand held sprayers offer solutions for chemical applications for various industries. All sprayers are simple to use and easy to maintain. Each unit is tested before it leaves the production area. Industrial grade sprayers can do what others tank sprayers cannot. For example, the pump can spray chlorine, diesel, wettable powders, stains, sealers, acids, and more. Compression sprayers only require one pumping session to empty the tank. Piston pumps won’t leak. Seal and O Rings made of high grade Viton that stand up to strong pressure washer detergent cleaners. A full line of parts are available should you need to maintain your hand held sprayers down the road. Choose from sprayers specific to your needs. The sprayer you are considering to purchase is of the highest quality – it uses finest virgin plastic, high-grade seals and gaskets, and take every precaution in the manufacturing of these units. However, the successful long-term and safe operation of your chemical sprayer resides with you. This line of tank sprayers are recommended for use in industries like agriculture, farming, forestry, pest control, constructions, and janitorial. You must take precautions to protect yourself while using a chemical sprayer and maintain regularly to ensure its longevity. This construction series are used for curing compounds, form release agents, form oil, diesel, oil-based sealers, water-based sealers. Do not use these hand held sprayers for acid stain, acid etching, muriatic acid, phosphoric acid, and viscous materials. Industrial construction hand held series are used for acid applications. These sprayers can withstand muriatic (hydrochloric) acid, hydrofluoric acid, or phosphoric acids. It can be used for staining or etching concrete and masonry, dissolving rust or scale on metal surfaces, cleaning, degreasing, and removing graffiti. A new extra large funnel opening for easier, faster, safer spill free filling. These are biodegradable chemical cleaners for window wash, automotive wash, and concrete cleaning & etch. We also have line of products for paint industry that can remove graffiti, paint hardener for easy paint removal and disposal, mold and mildew inhibitor, cleaner & renewal for paint brushes and more. For everyday cleaning these all-purpose cleaners can remove tough stains quickly and effectively to different kind of surfaces. These can be applied directly or with the use of pressure washer chemical injector for general cleaning. 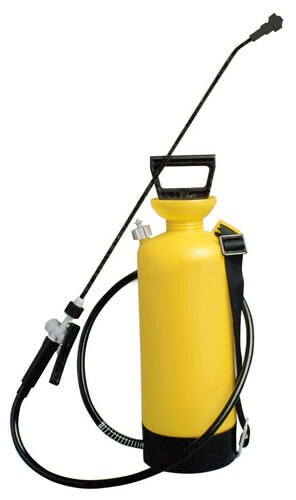 This sprayer can be used for many purposes and supports numerous chemicals.